Elana Dykewomon's fat feminism is some of my favourite fat activism of the early movement. It is rooted in her life as a poet, writer and editor. She is a cultural worker, meaning that her creative life is a political act, a reflection of her community, perhaps a gift of service. Her writing explores intersections of class, race, disability and lesbian sensibility. Like other powerful early fat feminists she is Jewish, and that is a significant part of the frame. 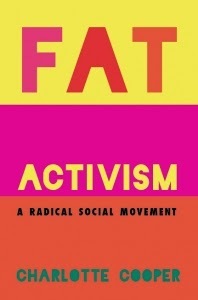 There are a couple of pieces that I think are particularly important for those who are interested in fat feminist activism, queer fat feminism and the fat activism that emerged from radical lesbian feminism. I came across Dykewomon's essay 'Traveling Fat' in Christian McEwen and Sue O'Sullivan's anthology Out The Other Side, published in 1988. It had already been published in Shadow on a Tightrope but it would be a few years until I got to read that book. I didn't expect to read about fat in a lesbian anthology, the fact that it was there was really exciting. Until then, the only accounts I'd read that tried to make sense of fat women's bodies were pathologising psychoanalytically-informed texts, not at all helpful. Traveling Fat charts Dykewomon's encounters with feminism and fat and they are frequently painful. 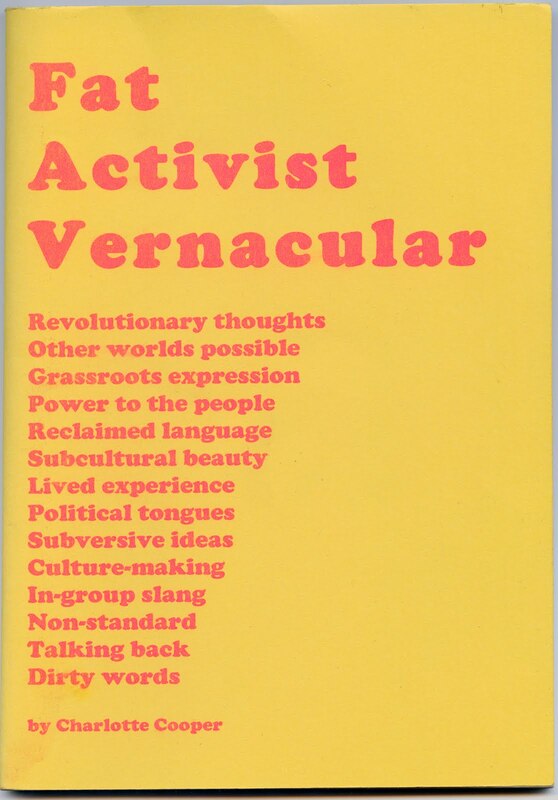 Although the world she was writing about was nothing like my own at the time (the idea of a national lesbian infrastructure seemed utopian beyond belief to me) her struggles with legitimacy and visibility in feminist community were all too relatable. The t-shirts still don't fit me and bodies like mine or bigger. The essay remains a rich snapshot of an era. Dykewomon published 'the real fat womon poems' in Sinister Wisdom #33 in 1987, around the time that she became editor of the journal. During her seven years of service she ensured that fat became part of the fabric of lesbian feminist politics and culture. 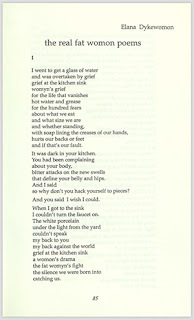 It is really gratifying to see fat there in the journal, in bios, in small ads as well as in poems and articles. 'the real fat womon poems' cover eleven epic sections and takes in intersectionality, imperialism, consumerism as well as quiet moments of realisation, irreverence and longing. It's a monumental piece of work that offers something new on each reading. Fat is present throughout Dykewomon's writing, often as a fact of life, a part of community. It's a very un-flashy approach to fat cultural activism but this tactic makes fat available, it can be talked about, explored. Dykewomon's writing gives me confidence to think about fat as I live and see it around me. 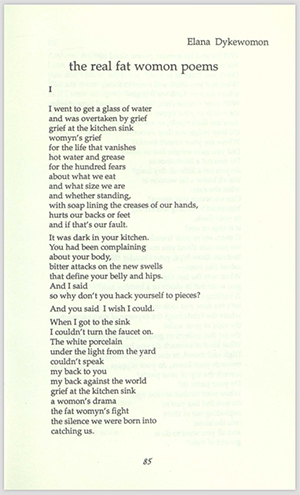 Dykewomon, E. (1983) 'Travelling Fat' in Schoenfielder, L. and Wieser, B., eds., Shadow on a Tightrope: Writings by Women on Fat Oppression, Iowa City: Aunt Lute, 144-154. Dykewomon, E. (1988) 'Traveling Fat' in McEwen, C. and O'Sullivan, S., eds., Out the Other Side: Contemporary Lesbian Writing, London: Virago, 21-29. Dykewomon, E. (1987) 'the real fat womon poems', Sinister Wisdom, 33, 85-93.